EIL Recruitment 2019 - Apply Online for 30 Executive Gr.-I & II Posts in EIL, New Delhi, Gurugram, Chennai, Vadodara, Kolkata, Mumbai, Across India on Fixed Term Basis. 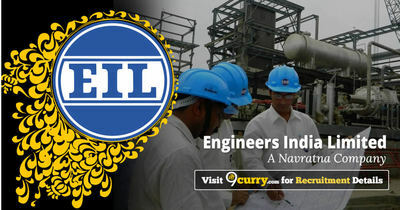 Online Applications are invited by Engineers India Limited (EIL) from 29 Mar 2019 to 16 Apr 2019 till 11:59 PM for 30 vacancies. Head Office New Delhi / Gurugram, Regional Offices at Chennai, Vadodara, Kolkata, Branch Office at Mumbai, Inspection Offices or Construction Sites etc. However, the place of posting can be anywhere in India and abroad depending upon the organizational requirement. 15 (UR –8 EWS-1 SC – 2 ST - 1 OBC -3) i) BE/ B. Tech/ B.Sc. (Engg.) in Mechanical discipline with minimum 60% marks or CGPA/ CPI. Eligible candidates may apply online at EIL's website (direct link is given below) from 29 Mar 2019 to 16 Apr 2019 till 11:59 PM. Read the information carefully & Click on "Post".